Quantity: An average of 24½ pounds is needed per canner load of 7 quarts; an average of 16 pounds is needed per canner load of 9 pints. A crate weighs 31 pounds and yields 7 to 12 quarts--an average of 3½ pounds per quart. Quality: Use tender, tight-tipped spears, 4 to 6 inches long. 2. Wash asparagus and trim off tough scales. Break off tough stems and wash again. Cut into 1-inch pieces or can whole. Hot pack or raw pack according to instructions below. Cover asparagus with boiling water. Boil 2 or 3 minutes. Loosely fill jars with hot asparagus, leaving 1-inch headspace. 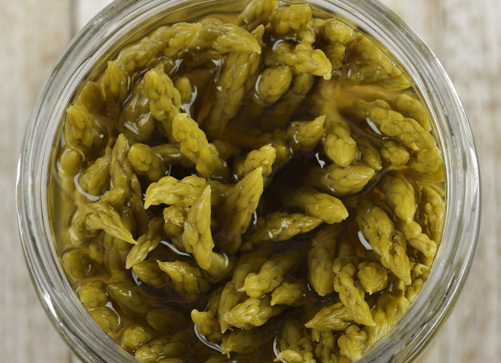 Fill jars with raw asparagus, packing as tightly as possible without crushing, leaving 1-inch headspace. 3. Add 1 teaspoon of salt per quart to the jars, if desired. Add boiling water, leaving 1-inch headspace. 5. Adjust lids and process in a pressure canner according to the recommendations. Let cool, undisturbed, 12-24 hours and check for seals.